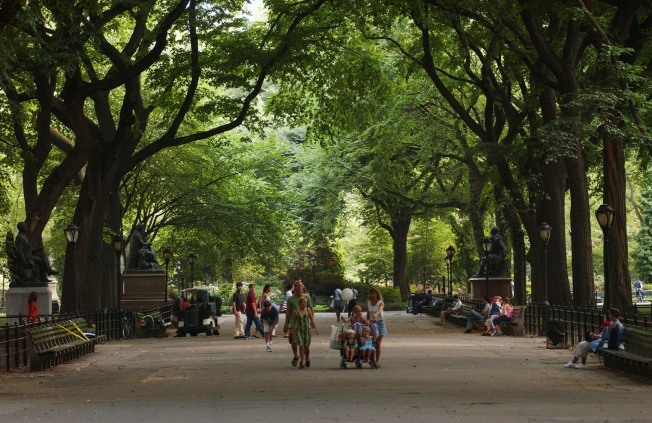 Central Park saw a crime spike in 2010 over the previous year, a new report says. Rapes and grand larceny stood out among the Central Park crimes that increased sharply in 2010, according to NYC Park Advocates, a watchdog group that tracks park crime. And there were 101 total crimes in 2010, compared to 70 crimes in 2009, a 44 percent increase. No rapes occurred in 2009 but seven were reported in 2010, according to the report. Grand larcenies rose from 40 in 2009 to 63 in 2010. No murders were reported in either year. The 2010 totals are still down drastically from two decades ago, when Central Park was considered off-limits after the sun set. In 1990, 368 crimes were reported there, including three murders and ten rapes. But those totals have decreased steadily over the years, and Central Park has been transformed into an outdoor escape for New Yorkers. With more people now using the park than ever before, advocates stressed safety is as important as ever. "Comparing it to the bad old days is not something we should be doing," said Geoffrey Croft, of NYC Park Advocates. "People have to be safe and any spike in crime is not good for public space." Croft estimated that much of the crime spate was concentrated in the northern section of Central Park, a more wooded and isolated part. NYPD played down the crime increase, noting that most of the grand larcenies result from people leaving their property unattended while off playing a game of Frisbee or softball. "While any crime increase concerns us, Central Park remains the safest precinct in the city," said Deputy Inspector Kim Y. Royster. The police department, which operates Central Park as its own precinct, responded to the spate increase in late 2010 by adding seven full time officers and ten part-time officers.